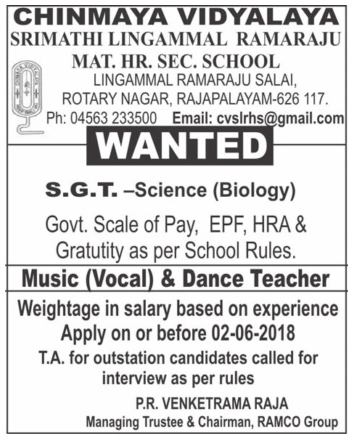 Chinmaya Vidyalaya Srimathi Lingammal Ramaraju Matric Hr Sec School, Rajapalayam has advertised in THE DINAMALAR newspaper for the recruitment of SGT vacancies. Interested and eligible job aspirants are requested to apply with in 2nd June 2018. Check out further more details below.